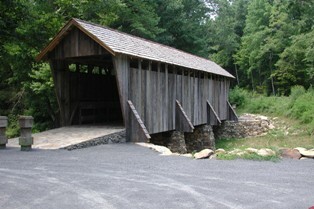 This historic structure, one of NC's two remaining covered bridges, was built in 1911 at a cost of $40. The bridge is 54 feet in length and crosses the West Fork Branch of the Little River within the Uwharrie National Forest and is a direct connection to the county's past mode of transportation when horse and wagon were common and automobile travel was in its infancy. Take exit 65 from I-73/I-74.